I just went for my 2 ultrasound at 8 weeks. What did your first ultrasound look like ?? Hi my name is jennifer also I am pg with twins and live in Gulfport. My twins are due July 10, 2010. 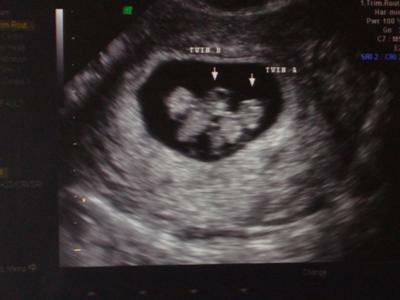 I can't help but notice your u/s looks like my first 2 at 7wks and at 10wks. At 12wks and 14wks they where finally able to see a membrane between the babies. So mine are Mo/DI, They share a outer sac, and placenta, but they have seperate amnotic sacs.